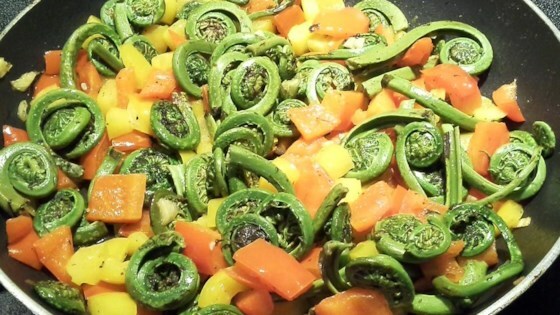 "This is a great recipe for those delicious fiddleheads that we can only enjoy fresh in the spring. Leftovers are great in an omelet or added to scrambled eggs for breakfast." Bring a pot of lightly salted water to a boil. Boil fiddlehead ferns for 10 minutes; drain. Heat olive oil in a skillet over medium heat, and cook and stir red pepper, yellow pepper, and garlic until peppers begin to soften, about 5 minutes. Stir fiddleheads into the skillet, and continue to cook and stir until fiddleheads are tender, about 2 minutes. Season with salt and pepper. Sautéed onions and peppers are tossed with penne pasta, fresh basil, and cheese. I added some tofu to the pan and served with new potatoes for a complete meal.